This video was shot on July 14, 2009 when the Democrats introduced HR 3200, the first attempt to enact socialized medicine in America since Hillary Clinton's failed Health Security Act of 1993. In this attempt, the Wikipedia view of what was happening and what legislation was being proffered in the House, is blatantly false. In the Wiki view, HR 3962 was introduced in the House of Representatives on Oct. 29, 2009. While that bill carried a "House designation," this was the Senate version of the bill. There had been a couple of attempts to initiate a bill in the House, but those attempts appear to have failed. This violated the Origination Clause of the Constitution from the gitgo. 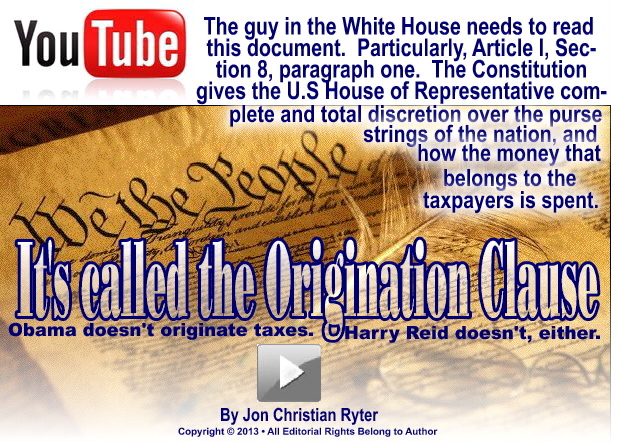 To make it appear that Congress met the Origination Clause test, the Democratic leadership in the House, Senate and Executive Branch gutted a dead House bill, HR 3590, and filled the body of the gutted bill with the verbiage from HR 3962 (which should have correctly been referred to as S.3962 since it was a Senate bill that originated in the upper chamber). Her new job is to make sure that all Americans and every American business is in compliance with the healthcare law. Think about that for a moment. 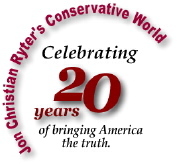 Midsized conservative owned company. Donating too much money to conservative candidates. Oops...they just lost their private coverage and are forced into Obamacare. Or, they receive a "friendly" call from the Affordable Care Act Office suggesting, based on their political contributions in the last election, not to donate money to this candidate or that one or the IRS might discover their company is no longer eligible to buy private insurance coverage on their employees. Based on Ingram's performance overseeing tax-exempt organizations, you get the picture. Just when you thought things couldn't get any worse under Obama you discover not only can they get worse, they are getting worse. Aren't you glad you voted for Obama in 2008? And, perhaps again in 2012? Nah, nobody would be that stupid except a social progressive. On Oct. 13, 2010, physicians like Dr. David Janda (an orthopedic surgeon) began warning us about the Obama Death Board and the Independent Payment Advisory Board they created which would solely and independently determine if you and I are worth the cost of some future operation that will be needed to save our lives. Janda and scores of doctors began warning their patients they would be denied lifesaving healthcare benefits and deliberately allowed to die to "cull the herd" of old people who were now too much of a drain on a system that could no longer afford to pay them. In most cases, those doctors also told their patients that when Obamacare went into affect, theythe physicianswould retire from practice. To date, thousands of medical doctors have done just that and scores of Democratsthe very ones grinning from ear to ear when Obamacare was signed into laware now calling it a "train wreck." The first to say it was Sen. Max Baucus [D-MT], one of the architects of the plan who told Health Secretary Kathleen Sebelius that he was worried the implementation of Obamacare was becoming a train wreck. Sen. Majority Leader Harry Reid [D-NV] who rammed the bill through the Senate without a single Republican vote, now agrees with Baucus. What is facing every Americanthose on Medicare or Obamacare or those who still have private coverageis skyrocketing insurance premiums and skyrocketing out-of-pocket medical expenses...if, that is, the Independent Payment Advisor Board and the National Coordinator for Health Information Technology allows them to be treated for whatever catastrophic illness they have. The American people need to wake up to the reality that the purpose of Obamacare is not to provide health care to anyone. It is to reduce the drag on Social Security to bring the number of benefits recipients in line with the numbers of recipients that the actuarial tables estimated would live long enough to collect those benefits. Government is solving what they believe is a over-population problem rather than an under-population problem by using euthanasia as a population control devise. Today they have begun to use it at both ends of the age corridor. By continuing to allow the slaughter of the unborn, the social progressives are murdering any chance the United States and the other industrial nations to rebound and recover. We are no longer "growing" enough new peopleboth workers and consumersto fill the "vacancies" created by the lack of replacement workers when those holding the jobs in a shrinking economy retire. Because those vacancies are not being filled because the aborted babies never had a chance to live, grow up, marry, work and produce the tax revenue government needs to pay the benefits it owes to the millions of workers who contributed the tax funds that should have been there to cover their retirement years because greedy politicians wasted those funds trying to be all things to all people. This video shows you how Obamacare beganthrough the eyes of one Republican. It has proven to be the train wreck the Democrats now admit it is. 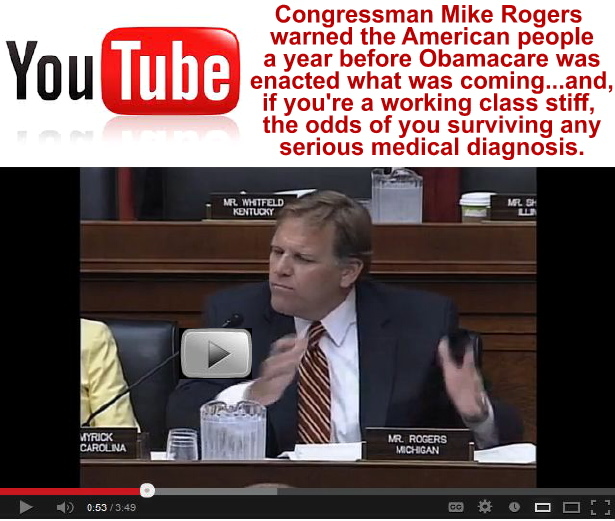 Watch Committee Chairman Henry Waxman ignore minority Congressman Rogers as he began to speak. No one on the dais is paying attention to him because Rogers' views mean nothing to them. This always happens in a system with one-party rule. Scary, isn't it? This video is a little bit of auld langsyne. What's happening in America now is the first chapter of the horror show that is rapidly destroying America. Because in this video, as much a minority statesman that Rogers was there, he still had a voice and the right to speak without being shot at the end of his five minutes. On July 16, 2009 when the House debated Nancy Pelosi's version of Obamacare, HR 3200 which would be flatly rejected out-of-hand by Sen. Harry Reid who would create the versionoriginated in the US Senate (which made it unconstitutional since the Senate version, illegally dubbed HR 3962, violated the Originality Clause of the Constitution)that, with a little shenanigans taking place in Joint Conference, became the unconstitutional law of the land. The bill Congressman Rogers is discussing is not the bill of which Nancy Pelosi would infamously say, "We need to hurry up and pass this bill so we can see what's in it." It was the original 1,500 page version of America's Affordable Health Choices Act of 2009. The status of the bill, when it was voted on, or that it was not voted on, has been scrubbed from The Library of Congress Thomas. Inserted into the record for future generations to read is fiction which will be viewed by those generations as truth since, why would the "custodians of truth" lie to us? That fiction is the false claim by the social progressives bureaucrats who have, over the years, become the caretakers of legislative history. That fiction? With the history of the only legitimate bill which meets the Originality Clause test, HR 3200, erased, the caretakers of legislative fiction in the Library of Congress Thomas, inserted this note for those looking for the legislative history of the Affordable Health Choices Act of 2009: "Note: For further action, see HR 3590 which became Public Law 111-148 on March 23, 2010, often referred to as the Affordable Care Act, is the bill that became the health care reform law." 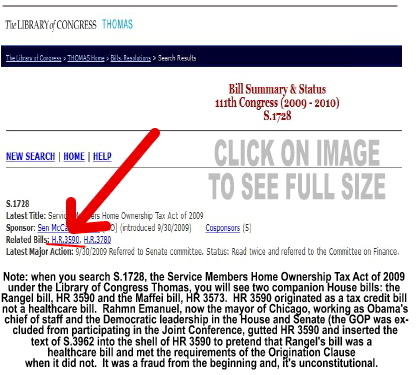 No one should know better than the curators of the Library of Congress that statement was a lie since HR 3590 was enrolled by Congressman Charlie Rangel [D-NY] as the Service Members Home Ownership Tax Act of 2009 on Sept. 17, 2009. It passed the House by a vote of 416-0, but died in the Senate. HR 3590 had nothing to do with healthcare. Ever. It was a bill to provide first time military personnel home buyers with a tax credit as a reward for their service to the nation. Sen. Clare McCaskell [D-MO] introduced the Senate version of this bill as S.1728 on Sept. 30, 2009. McCaskell's bill never got out of committee. It was buried in a desk drawer and never saw the light of day. Click on the Library of Congress image (here). It will open to the Library of Congress page for S.1728 which shows it's companion House bill, the Service Members Home Ownership Tax Act of 2009 existed, although the House version of that bill has been scrubbed and now contains the text for the Patient Protection and Affordable Care Act. (If that page suddenly disappears, simply click on the image directly above. I made a screen shot of the Library of Congress page which shows that HR 3590 is the Service Members Home Ownership Tax Act of 2009 and NOT Obamacare. Two companion House bills are shown on the S.1728 Thomas page. Both proposed a new home tax credit for military people. Rangel's bill was HR 3590. Congressman Dan Maffei [D-NY] introduced his version as the Service Members Home Buyer Tax Credit Extension Act of 2009 on October 8. But Rangel's bill is the one that passed the House on a 416-0. It is also the non-healthcare bill that mysteriously morphed into the version of Obamacare that became the law of the land. I don't think, by the rules, you get to use bills over again if you need an earlier date although it's common practice in both the House and Senate by Congressmen and Senators who try to conceal earmarks and other quid pro quos that the folks back home won't understand and will likely vote you out of office if they find out. The scrubbing of the honest legislative history of Obamacare (HR 3590 and HR 3962) did not just take place on the government's websites, but it was pretty much a universal cleansing that included not only the dominant search engines, but Wikipedia, the primary encyclopedic website most Americans visit as they search for hard facts when they visit the Internet for the "is it, or is it not?" answers about HR 3590. Call anyone on the Hillon either side of the aisleand ask them how the Democrats were able to gut a House bill and replace all but the first line of the Service Members Home Mortgage Tax Act of 2009 (which 416 House members had just voted on as HR 3590and passed it) and not question it when it shows up in the Supreme Court as proof that the Democrats abided by the Origination Clause; and that HR 3590 was enrolled as the Affordable Health Choices Act of 2009 and that it preceded HR 3962 in the House of Representatives. Of course HR 3590 did precede HR 3962 (wholly a smoke-and-mirrors Senate bill posing as a House bill). However, HR 3590's entire life before the Joint Conference where the House and Senate bills "marry," was as the Service Members Home Ownership Tax Act of 2009. So, when you decide it's time for the House to file suit against the Senate for faking legislation by gutting a bill enrolled in the House on Sept. 17, 2009 and substituting 100% of the verbiage to make it appear that this fake piece of legislation met the requirements of the Origination Clause and preceded the Senate version, HR 3962 which was enrolled in the Senate on October 29, 2009. While HR 3590 preceded HR 3962, Obamacare still violates the Origination Clause because on Sept. 17, 2009 and until it was gutted in Joint Conference, HR 3590 did not deal with Obamacare. HR 3962 violates the Origination Clause and those who perpetuated a fraud in a technically sworn affidavit to the Supreme Court are guilty of perjury before the highest court in the land. I think that's a felony. I know it's an impeachable offense. Those in both Houses of Congress, who by their silence for whatever reason protect those who perpetuated this fraud on America, do not deserve the legislative positions they hold. When they stonewall the citizens they work for by knowingly lying to them when the taxpayers question what appears to be an impropriety, those politicians need to go. Members of both parties in both the House and Senate who participate in criminal malfeasance need to be removed from office, tried in a court of law and imprisoned for a long, long time. Those with knowledge of this wrongdoing who choose silence instead of action need to be removed from office for violating the public trust. It is time to demand that the House of Representatives file suit in the US Supreme Court to set aside Obamacare for violating the Origination Clause. Any Congressman who tries to snow you by assuring you that the "gutting of HR 3590" didn't happen, needs to be added to a list of politicians who will be recalled and removed from office before this year ends.